Huge alien spacecraft enter Earth's atmosphere and hang menacingly about the world's great cities. 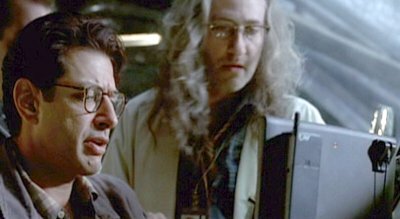 Television engineer David Levinson discovered a hidden countdown signal disrupting satellite television and fears the worst. 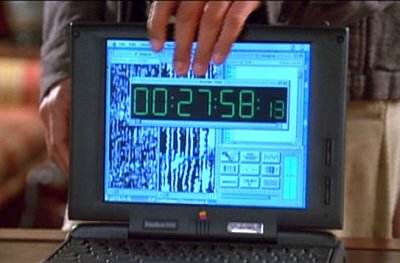 David uses the Powerbook to display the coundown to the alien attack, and later to infect the alien mothership with a virus, disabling the attackers' defenses.. The alien ships have indestructible shields. 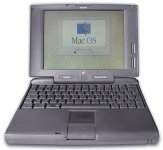 David's virus, delivered by the Powerbook, allows a successful attack. 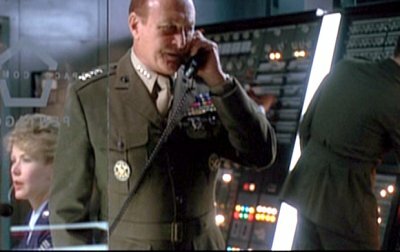 Let's face it - it's one on the sillier movie plots involving a computer, isn't it! 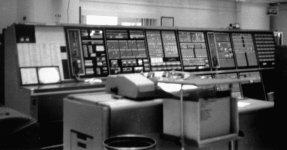 The Pentagon's "Space Command" is equipped with a SAGE system.